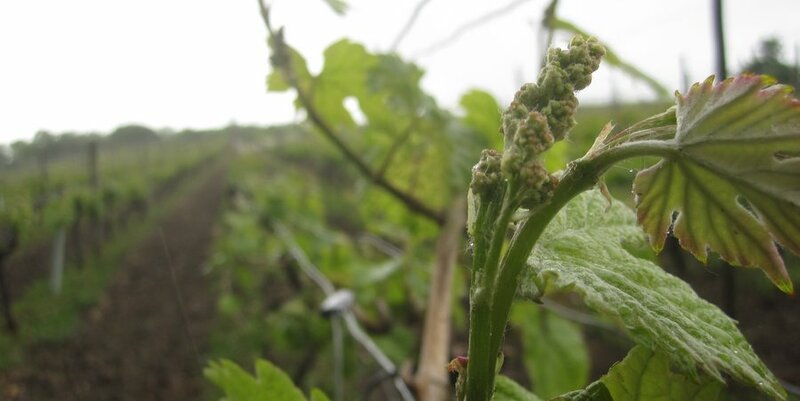 A vine, a bud, rain, grey skies – this is Leventhorpe Vineyard, just outside Leeds, in mid-May. Yes, that Leeds. The one in Yorkshire. I spent last weekend engaged in one of my more unlikely wine tours while researching an article for next weekend’s Guardian travel section, and a very interesting time was had by all. Well, by me, mainly. There are seven vineyards in Yorkshire and most of them are pretty new, having been established in the last five years. Because they’re so northerly, and hence cold and wet and stuff, they have to grow varieties you haven’t really heard of before, bred specifically to succeed in those conditions: ortega, siegerrebe, rondo and solaris are the most common names. And these funny-sounding grapes make funny-tasting wine, stuff that swishes around your mouth behaving quite unlike any wine that you’re used to. I tried my best to keep the most open of minds. They might not taste like what your brain tells you wine should taste like, but they sometimes still make for a perfectly enjoyable alcoholic beverage. The advent of solaris, a terribly modern German-bred grape that ripens early and with loads of sugar, has allowed Holmfirth Vineyard to produce a 100% solaris wine that naturally reaches 13% alcohol and is water white, steely dry and admirably clean and bright. Ryedale make a couple of very decent rosés. Leventhorpe make a seyval blanc of some repute. But it’s not just about the booze. Nobody plants a vineyard in Yorkshire without have a pretty good story to tell, and I’ll remember the people I met on my trip long after I’ve forgotten their wines – and I don’t mean that as a criticism of their product. There’s one winemaker, for example, who has dedicated much of his life to vines, is absolutely obsessed by them and everything about them, but refuses to drink for fear of getting a deathly headache. Sometimes the conversation is more sparkling than anything that comes in bottles (though having said that there wasn’t any fizz to be seen, though there will be soon: at least two of the vineyards will release their first sparklers in 2012). I’d encourage you to drop in on one, if you get the chance. But all I can add for now is that if you want any more detail you’ll have to click here, or buy next Saturday’s Guardian. I thought Leventhorpe’s Madeleine Angevine 2009 was a notch or two above a ‘perfectly enjoyable alcoholic beverage’. White grapefruit and with a bit of smoke. I didn’t actually try Leventhorpe’s wines – the owner was on holiday, so I just went to poke around the totally deserted vineyard so I could see where it was, in case there was anything particularly exciting about its location. Which there isn’t, not really, although there is a butcher not far away that has won awards for his sausages. I was under the impression that the PR guy who put my trip together would stick a couple of bottles of his wines in the place where we stayed, so I’d try them later. But he didn’t, and I didn’t see them for sale anywhere. So I’ll take your word for it. I was referring mainly to Holmfirth’s new, limited edition dry solaris, which tastes a bit funny, but definitely not bad. I brought a bottle home and will write up a proper review when I open it. Sounds like a missed opportunity by the PR. Shame.